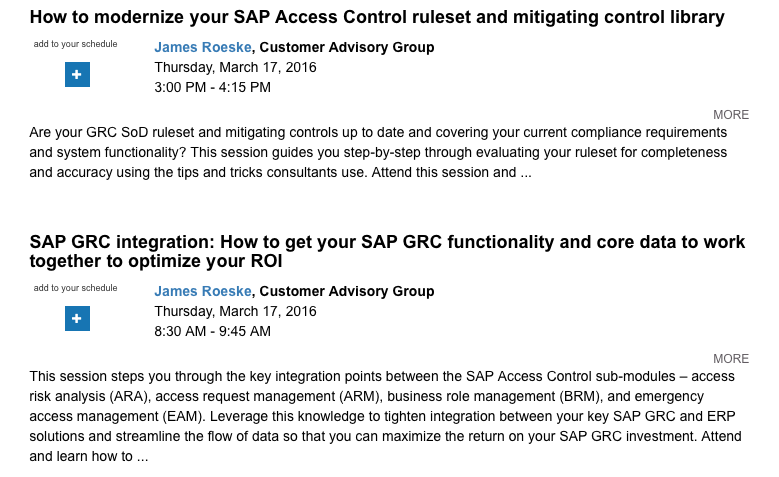 We are proud to announce that Customer Advisory Group will be presenting at the upcoming SAPinsider GRC 2016 conference, taking place March 15-18 at the MGM Grand Las Vegas. Join us for hand-picked sessions, featuring actionable insights from the world's most knowledgeable GRC experts, and real-world advice from customers who can't wait to share their stories. Your attendance will give you access to more than 200 sessions delivered by top SAP customers, consultants, and SAP's own solution experts. Together, they'll help you connect the dots between the technical capabilities of your SAP landscape and the practical demands of your business. Our close collaboration with SAPinsider this year has made it possible to extend a special registration discount of up to $400 off the onsite price to all of our valued partners, clients and colleagues who have not yet registered. To receive your discount, you must enter the conference websites through the links in this email. You can get view the full agenda as well as claim your $400 registration discount by visiting www.grc2016.com/CustomerAdvisoryGroup or by calling +1-781-751-8700.